With Dublin reform stalled, European leaders began to cast around for new ideas to solve the ongoing political crisis on migration and settled on a recurring proposition: the creation of asylum processing centres beyond the (strengthened) borders of the European Union. What exactly is up for discussion remains unclear. The plans championed by various EU leaders are diverse, yet the details remain fuzzy. What they have in common is a near-universal focus on shifting responsibility for dealing with refugees and migrants upstream. The idea of external processing looks good on paper, particularly in demonstrating to skeptical voters that governments have control over migration flows. But leaders also hope that by reducing inflows to the European Union, they will face less pressure to compromise on sharing responsibility for asylum within the bloc. The devil is in the detail. Proposals to externalize the processing of asylum claims are not new, but have largely fallen flat. Previous leaders balked at the idea of such elaborate constructions, especially when confronted with their significant practical complications. But public pressure to further slow arrivals of refugee and migrant boats has mounted in many countries, and leaders feel compelled to find an agreement. The result is a debate on migration increasingly divorced from reality. But before sitting down to the negotiating table, EU leaders may want to reflect on the exact model they wish to pursue, and the tradeoffs involved. Critically, does the concept of “regional disembarkation platforms” set out in the draft European Council conclusions offer a potential solution? From Austria’s so-called Future European Protection System, to the “centres of international protection in transit countries” suggested by Italian Prime Minister Giuseppe Conte, to an outlier idea from the Danish Prime Minister to create centres to host failed asylum seekers in “undesirable” parts of Europe —a variety of models for externalization have been floated in recent weeks. Several proposals also envisage the simultaneous creation of joint processing centres within the European Union, coupled with the use of reception centres that restrict residents’ freedom of movement. While it is still unclear how such a plan would unfold, this commentary focuses on the external dimension alone. Where Would People Be Stopped and Processed? The proposals differ regarding where in the journey they would stop migrants and potential asylum seekers. French President Emmanuel Macron has vaguely referred to centres in key transit countries, such as Niger, Libya, and Chad, as well as closer to regions of origin. Others have focused more squarely on the North African coast. Centres operating far away from the European Union would likely function as a form of resettlement, stopping people en route (or even prior to the journey), and offering selected individuals an additional channel of EU entry in hopes that this would discourage the use of smugglers. Indeed, nascent EU efforts to resettle refugees evacuated from Libya to Niger (under the Evacuation Transit Mechanism, or ETM), demonstrate how this might work. At the other extreme, the model championed by Austrian Chancellor Sebastian Kurz would see migrants and refugees returned to “safe zones” in Africa, where they would stay, even after arriving at the external EU border. The latter concept is problematic under current EU and international law. By returning arrivals to third countries without giving them the opportunity to submit an asylum claim, governments would be likely to run afoul of the EU Asylum Procedures Directive, as well as the European Convention on Human Rights, which prohibits signatories from the “collective expulsion of aliens.” European Court of Human Rights case law also precludes the pushback of migrants rescued by European boats while crossing the Mediterranean. Conversely, however, if migrants and potential asylum seekers are stopped before entering EU waters, and without the involvement of European-flagged vessels, then no EU Member State has formal legal responsibility. A framework for regional cooperation on the disembarkation of migrant boats—being developed by the UN High Commissioner for Refugees (UNHCR) —may offer a middle ground. While details are scarce, it seems likely that the proposal would focus first on the development of a system for determining who would rescue migrants crossing the Mediterranean, and where they would be landed. Absent consensus within the European Union on responsibility sharing for asylum claims, UNHCR would attempt to create a new framework for responsibility sharing with both Northern and Southern Mediterranean states on search and rescue. However, to prove palatable to partners, such a scheme would require strong EU support, not least through the creation of regional disembarkation centres across North Africa where migrants and refugees “pulled back” from their journey would be sent. This approach would sidestep the application of EU law. To be viable, the European Union would likely need to offer North African partner states some assurance of support, including resettling some of those found in need of protection (as with the Niger ETM). Who Would Do the Processing? Once asylum seekers are pulled back, there is the question of who would make determinations regarding their protection. There are three options. First, Member States’ own asylum agencies could adjudicate protection claims, as Macron has occasionally suggested. Aside from the logistical challenges of seconding officials outside Europe, the question quickly arises as to who would adjudicate which applications? Member States have very different asylum systems, which produce markedly different outcomes for applicants, and would need extensive coordination. As a result, there is growing interest in developing an EU asylum agency capable of undertaking assessments on behalf of Member States. This appears a neat solution. However, governments would have to agree joint procedures and standards for processing claims and have confidence in the decisions made by through a joint processing arrangement. This is, if anything, an option only in the long term, as it would be years before any such agency is operational. Should the regional disembarkation idea gain ground, the European Union would have no legal responsibility to undertake assessment. Most Member States would be likely to consider UNHCR a key partner to manage any external process. But doing so could require UNHCR to redeploy limited staff resources from existing resettlement operations or from pressing humanitarian situations elsewhere. Moreover, outsourcing to UNHCR could still raise the issue of trust and transferability of decisions. Many Member States remain reluctant to rely solely on UNHCR to select refugees for resettlement, preferring to send their own teams to do the final selection. The issue of what happens to people after their protection claims are assessed remains at the crux of questions around the feasibility of external processing. Proposals here differ starkly. On the one hand, some proposals would allow those recognized as in need of protection to subsequently enter the European Union. This is the option that—even if the European Union has circumvented any legal responsibility—would be deemed necessary to host countries as it would give them assurance that they are not overly burdened with providing protection. But doing so would require Member States to agree on some sort of distribution system or quotas for determining who would be settled where—crashing back into a responsibility-sharing problem that has plagued the European Union. By contrast, proposals that would explicitly not allow entry to anyone who had attempted to travel to Europe via the Mediterranean, taking a page from Australia’s playbook, are meant to assuage fears that such centres would become magnets for new travellers. Those with protection needs brought to such centres would be settled in countries outside the bloc. The challenges with this model centre squarely on the difficulty finding a “safe” country that would allow the settlement of potentially unlimited number of protection beneficiaries. Neither is likely to be the case in any arrangements the European Union would seek to make with external countries. Finally, there is the troubling question of what to do with those denied status or resettlement in the European Union. While the International Organization for Migration (IOM) or another agency might be able to help facilitate voluntary return, some might not be able to return home or may have been denied resettlement but nonetheless have protection needs. They are at risk of becoming a population in limbo, with long-term implications for their well-being and for the host country. Source: Authors' interpretation of how the models would work in practice. Model adoption aside, a number of practical challenges need to be overcome. First, and at a very basic level, all plans rely on having a partner country in Africa (or the Western Balkans) willing to take responsibility for hosting the processing centres and the indeterminate number of arrivals. Few countries seem likely to do so. And even if a willing partner could be found, such agreements are likely to be fragile and dependent on the European Union exerting ongoing pressure and providing financial and practical support to the partner country. Unilateral action is never a strong basis for a relationship and in fact undermines trust. Moreover, securing the cooperation of external countries will likely take significant Member State investments of time and financial resources, possibly diverting from other foreign policy priorities. The horrific experiences of many migrants in Libya have demonstrated the potential humanitarian risks that outsourcing responsibility to third countries can have. Indeed, the European Union has struggled to maintain its own standards, evidenced by continued poor conditions on the Greek islands. Any centres established under an external processing arrangement would need to be operated by an independent agency that can ensure that they meet minimal standards of care and humane treatment. This will be difficult in countries that have limited experience with either asylum or management of humanitarian flows. That UNHCR may be willing to support regional disembarkation is important, as it would hopefully ensure that centres are overseen by an international agency that can monitor and prevent abuse—an improvement over the current situation. It would also create a way out for NGO rescue boats sailing under international flags that are being prevented from docking in Italy. But should the system prove problematic, UNHCR and IOM may risk their own credibility as organizations designed to protect refugees and migrants in crisis. It may also negatively affect their relationships with non-European countries. Beyond the resource-intensive nature of the concept, there are significant diplomatic tradeoffs for UN agencies to consider. 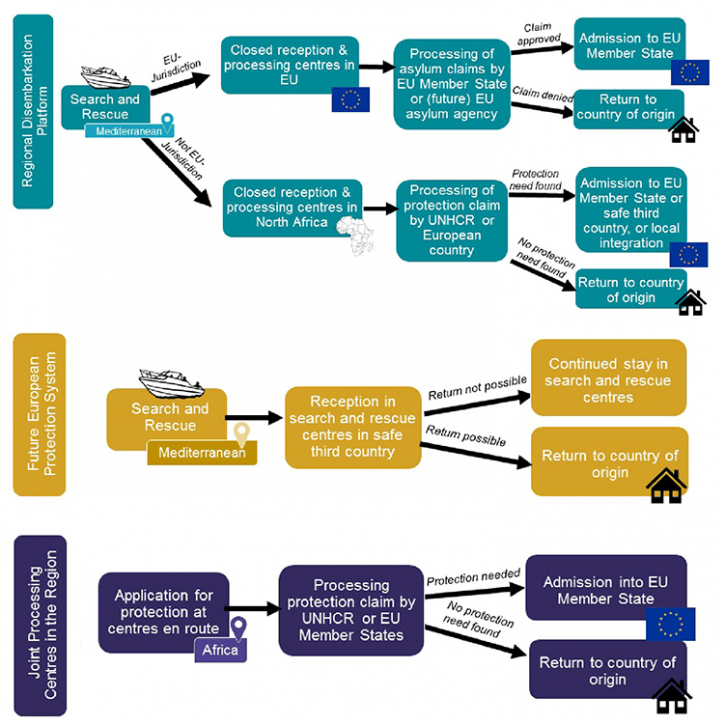 At a practical level, there are also questions about how quickly any efforts to move people from a processing centre to the European Union would operate. The Libya-Niger ETM in operation since the end of 2017, for example, had resettled fewer than 250 people by May, out of nearly 3,800 resettlement spots pledged by EU Member States. UNHCR had to suspend its evacuation efforts in March because resettlement from Niger was not sufficiently keeping pace with new arrivals from Libya and shelter capacity in Niger. It is likely that any regional disembarkation platforms will be small-scale in the short to medium term, and expectations should be managed accordingly. Any external processing arrangement is unlikely to be inexpensive, whether Member States manage the centres and processing themselves or pay UNHCR to do so. Ultimately, Member States will need to be prepared to pay for adjudications staff, reception and care facilities for migrants and refugees staying at the centres, and the management of the logistical details involved in the processing. One important consequence of external processing is likely to be a diversion of staff resources and funding away from other urgent humanitarian situations or resettlement programs. Most models foresee some movement of beneficiaries of international protection from centres to the European Union. While these numbers are likely to remain low, the challenge of responsibility sharing between Member States remains part of the puzzle. While some states suggest this could remain a voluntary process amongst willing governments, it is not clear that this will be sufficient to manage such a process in the long term. While external processing faces a host of practical challenges, the truth may be that for many current EU leaders, the feasibility of these schemes is less important than delivering action. The most deeply felt effects, however, may be on the stability of the international norms that support the refugee regime, and particularly the principle of territorial asylum. The days of the territorial asylum regime may indeed be numbered. Horst Seehofer’s Migration Plan for Germany: Another Nail in the Coffin of Europe’s Asylum System?